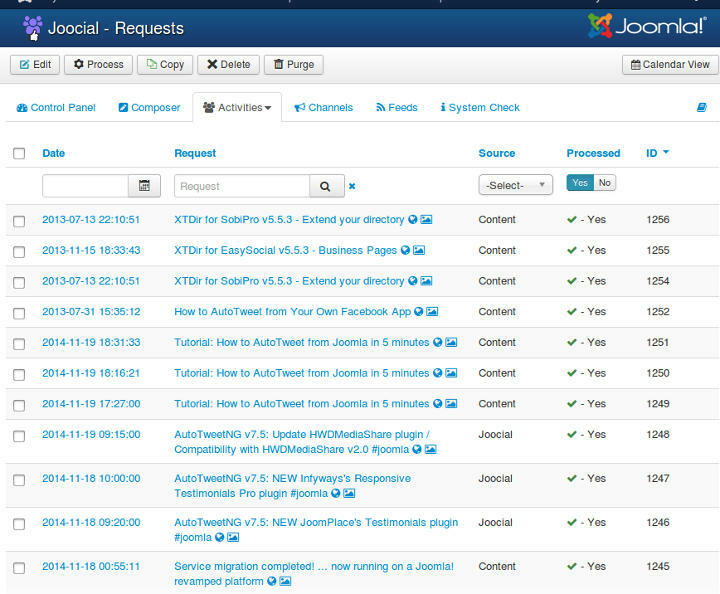 You can access this feature by clicking on Requests in the toolbar links area of AutoTweetNG or Joocial . Request are the first the processing instance of a message in the way to be published. When content is created, a Request is generated and stored in the request list. The processed status can be Yes or No. Edit: a request can be edited to modify its attributes. Process: a request can be manually processed, for instance, to avoid a delay until Autotweet Automator plugin is executed. Copy: a request can be copied, to be duplicated. For example, to schedule a repetition. Delete: a request can be deleted to avoid any further processing. Purge: Once in a while, all request can be purged to clear the database. Batch operation: a set of Requests can be moved from the processed status.